Ascochyta symptoms on garbanzo leaves. 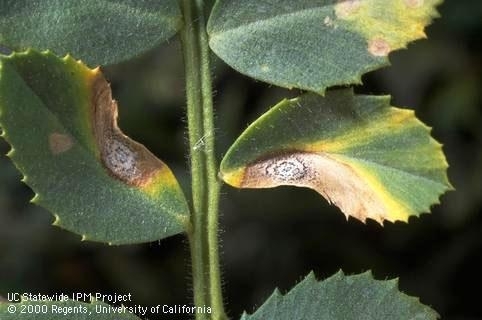 Ascochyta blight (Ascochyta rabiei, Didymella rabiei) was recently found in volunteer garbanzos in the Sacramento Valley, so keep an eye out for this disease in your production fields and be sure to control all volunteer garbs on your farm (yes, these volunteers are now long gone). 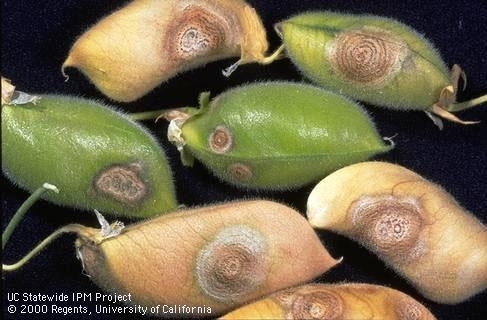 Ascochyta is a serious fungal disease of garbanzos that can kill seedlings and significantly reduce yields and seed quality in older infected plants. There are no other known crop or weed hosts. This disease is favored by cool, rainy weather and only infects the above ground parts of the plants. Early symptoms include circular light brown lesions on the plants that cause stems to weaken and break. Over time small, black, raised spots (pycnidia-like spores) will form concentric rings in the lesions. Developing seeds can become infected and, if used for seed, can lead to early infections in the next crop. The fungus survives outside or inside the seed. Characteristic concentric fungal rings on leaves. Ascochyta fungal rings on pods. The fungus survives only on crop debris (and seed), not in soil. It does not produce resting spores to survive in soil. How long the debris can persist before decomposing depends on the climatic conditions. It lasts longer in drier conditions. During wet weather, spores are released and infect plants. Moderate temperatures (68º to 77ºF) and wet weather are optimal conditions for severe disease development. Keep stands healthy, as disease resistance can break down in stressed fields. Always use certified, disease free seed. 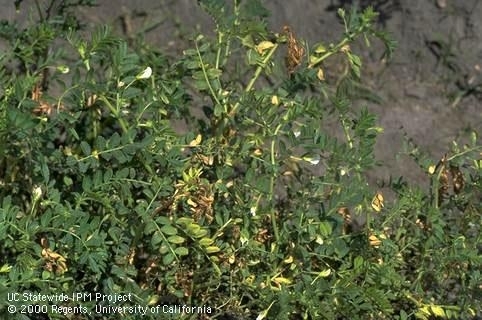 Thoroughly incorporate infested garbanzo residue to hasten decomposition and to minimize the possibility of spore production and dissemination. Rotate to other crops for two or three years. That will eliminate inoculum in the soil because the fungus will not survive in the absence of a garbanzo host. Avoid early plantings (November and early December) since they result in large plants and a thick canopy, which provides ideal conditions conducive to disease development. Consider wide row and plant spacing. This increases ventilation between plants, reducing favorable conditions for plant infection. Use treated seed to avoid introducing the fungus to the field, such as Mertect 340-F, thiabendazole. Foliar applications of fungicides limit the rate of disease spread. Apply fungicides at first sign of disease and reapply according to the label if rainy weather is forecasted. Thorough coverage of the plant canopy is important. Options include Quadris (azoxystrobin), Endura (boscalid), or Headline (pyraclostrobin). 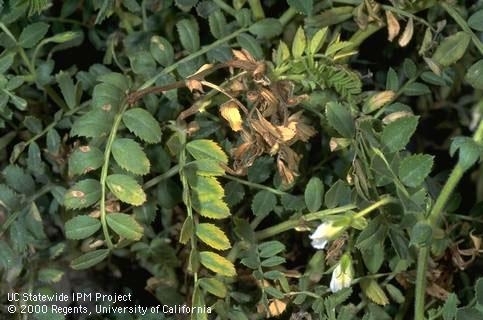 For more information, refer to the UC IPM website for dry beans or publication 8259, Ascochyta Blight of Garbanzos, by Frate et al. 2007.